On our website, we hope you will find something to add sparkle to your bathroom. We feature a wide variety of fine antique and reproduction fixtures and accessories to enhance the turn-of-the-century decor and help create that special feeling of golden days gone by. Our policy is dedication to providing personalized service and prompt delivery, as we have since 1976. Bathroom Machineries, a division of Domestic Environmental Alternatives, is a well established specialty plumbing and supply store located in the historic Mother Lode town of Murphys, California. Ray R. Buyer/Sales Ray’s been with us for 19 years and will be thrown in with the purchase if we ever sell the company. Use the contact form with any purchasing or general questions. Jim F. “Artist in Residence” and rapidly learning metal polishing skills. Been with us 2 years. John V. General Manager/Webmaster. John’s been doing either plumbing or restoration work since he was 12. Now with over 37 years experience, he can answer your technical questions. Use the contact form to get in touch with him with any technical questions. Kelly A. Use the contact form and with any accounts payable or accounts receivable questions. Lydia S. Lydia is here to keep our showroom clean, profitable, and to answer any general product questions. She’s the daughter of our founder, and has been around plumbing a long time. Use the contact form to get in touch with Lydia regarding any general questions. Select RecipientBuyer/Sales - Ray R.General Manager/Webmaster - John V.Restoration Shop Foreman - John V.Accounts Payable / Accounts Receivable - Kelly A.General Product Questions - Lydia S.
Let's make sure you're not a robot. Please answer the following math question. What's the total of 50 minus 10? In our historic 1901 building, formerly an Oddfellows Club meeting hall. We are located at 495 Main Street in the historic Gold Rush town of Murphys California. Our showrooms are open from 8am to 4:30pm weekdays, 10am to 3:30pm Saturdays and 11 to 4 Sundays. We hope you can make a day of your visit and will take the time to visit the many fine shops and restaurants of Murphys as well as tour the innumerable wineries and limestone caverns in the area. If you are planning on driving to see us with the intent of purchasing merchandise you have seen on this website, please be aware that not all of the items in our inventory are available on a will-call basis. Many items are built, machined, and/or finished right on the premises as they are ordered. Many custom and antique items may not be available for same-day pickup. We recommend that you call ahead to check availability, especially if you are planning on visiting on the weekend when our workshops are closed. Though we stock about 90% of the items on our website, some items, including new pedestal sinks, new toilets, china shelves, Rohl faucets, 24-series basins, and new clawfoot tubs are sent factory-direct and/or may not be in-stock in all colors, finishes, or styles. High and Low tank toilets are assembled and water tested as they ordered. If you wish to will-call one, you’ll need to call ahead if you want to take it home the same day. 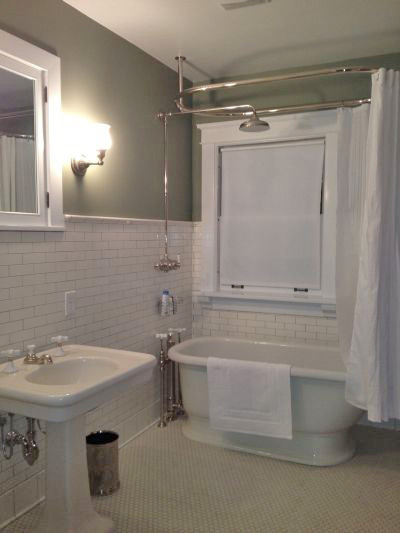 Just completed, first bath, Chicago IL. More in the works!